AIM Clinic - Portfolio | A Full Service Marketing Agency based in Toronto, Canada - Karmatize Inc. 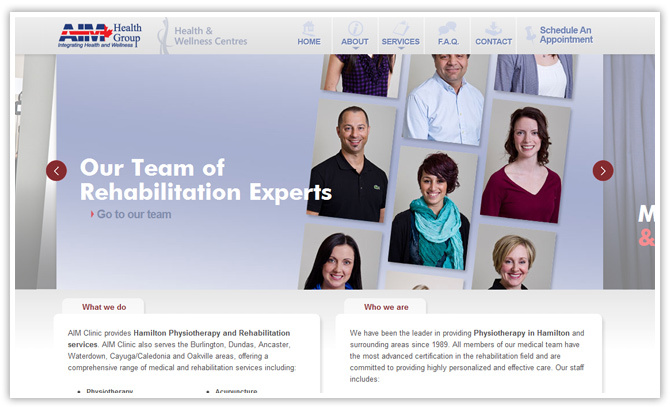 AIM Clinic provides a wide variety of physiotherapy and rehabilitation services for people with physical problems. AIM Clinic was completing in a very competitive market, and they needed a strategy to increase their exposure online. They had built a strong reputation within the community, and they had done a fantastic job establishing their customer base. However, their online presence was severely lacking and was not helping them attract new business. Their original website had extremely poor usability, and content was difficult to find both by users and search engines. Moreover, many users did not have a way to schedule an appointment or contact the clinic because there was no way to do so. Therefore, AIM Clinic needed a website and an online strategy that would help them compete against their competition who already had established themselves online. AIM Clinic had lots of information, but much of it was disorganized or too vague in nature. Therefore, we started at the top by developing an information architecture that consolidated similar sections as well as writing entire sections from the ground up. A lot of attention was paid to optimizing the content for certain keywords and phrases so that they would stand out within searches. Visually, we developed a strong design with clear navigation and action items. Since launch many users have booked appointments and/or contacted AIM Clinic via the newly created online forms. Likewise, they have also seen a large jump in traffic coming directly from search engines. Their online presence now is a very important extension of their business and helps them attract new customers every day.